Is the kindness of strangers a cause for celebration or concern? An encounter with a generous Turkish innkeeper makes Los Angles reader Dana Carmel Bell reconsider her skepticism. CAPPADOCIA, Turkey – It's a land of fairy chimneys, cave dwellings, and ancient underground cities that once housed thousands of early Christians seeking refuge from persecution by Romans, and later, from raiding Muslims. Today, Cappadocia, which translates as “land of beautiful horses,” makes for an otherworldly destination for its landscape of unique-shaped volcanic rocks. Top on the traveler wish lists: sleeping in caves carved from volcanic remnants. 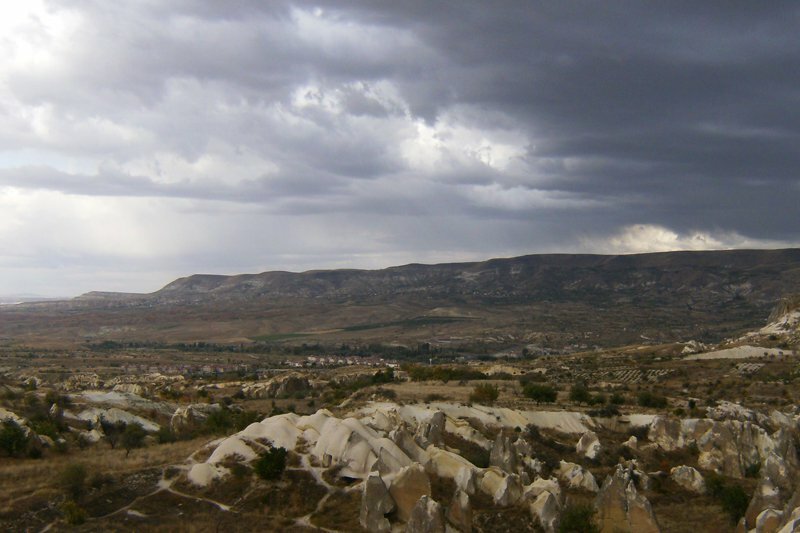 Such was our motivation for staying at a cave hotel in Göreme, Cappadocia’s most frequented town. As was the case throughout our visit in Turkey, we were welcomed warmly and showered with hospitality by our innkeeper. He drove us to town to buy pizza, refused to accept a tip, and engaged in hour-long chats with us about love, life, and everything in between over bottles of complimentary local red wine. On our last day, we accepted his invitation to share a few bottles of wine with him from somewhere near our hotel that offered panoramic nighttime views of fairy country. True to his word, later that evening, he came knocking on our door, wine and glasses in hand, ready for our excursion. He led us up a dark, winding road to some unseen destination. “How much longer before we get there?” I asked about five minutes into our walk. “About ten more minutes,” he replied, pointing up the hilly road. At that moment, my American sensibilities kicked in, and my mother’s words of caution began to ring loudly in my ears, as did the grisly missing person and murder mysteries that she’d shared with me from countless episodes of Nancy Grace and Dateline. Before heading to Turkey, I had promised her that we would return in one piece. But as we continued walking, I had an uncanny feeling that I was going to let her down. No longer able to tolerate my tightening grip, my husband told our innkeeper that we were going to head back. With a mixture of confusion and disappointment, our innkeeper assured us that we were almost at the top, but we had already begun our descent. Back at the hotel, determined for us to still enjoy a nighttime view, our innkeeper lead us up to the rooftop and popped open the bottles. As I sipped my wine with relief that we wouldn’t be victims of a Turkish countryside murder, I realized just how foreign the idea of hospitality is to me. More likely than not, our innkeeper hadn’t meant any harm. And I’m almost sure that there weren’t any Turkish bandits waiting at the top of the hill for a chance to beat us and rob us where no one could hear our screams. I felt silly. He just wanted to share a bottle of wine and a great view. But the idea that someone would engage with us and treat us like longtime friends without expecting anything in return was too much for me to imagine. It makes me wonder if Americans have gone wrong. Are we so disciplined to expect the worst from people that random acts of kindness seem unnatural? Are we so jaded by stories of danger and disaster that our innkeeper’s hospitality seemed too good to be true? In America, we’ve developed a culture of fear. But our trip to Cappadocia opened my eyes to a new culture – one that embraces strangers, puts them at ease, and welcomes them with open arms. The world's a big place and Fathom wants to cover it all. We want to hear from you. Tell us your story. Dana is a world traveler, cultural explorer, and community servant. When not at her day job, she volunteers locally and abroad with Passporters or plots adventures for her new venture, Time Travel Plans. She travels for the culture.